The Home Energy Resources Unit (HERU) is a world-first global solution that literally gives you the power of generating hot water for your home from everyday items you previously had little option but to discard as waste. Manik Ventures, the company behind the HERU, have a laboratory near Evesham and it is from here that this ground-breaking technology has been developed over the last few years. The unit utilises a well-known industrial heat treatment technique known as pyrolysis, but at lower temperatures than normal (3000C). Pyrolysis is a thermochemical decomposition process, converting substances, in the absence of oxygen, into oil, synthesised gas (syngas) and char. The HERU enables every household to become a micro energy generation centre, generating hot water and gas which can be used in a domestic boiler. This reduces the household fuel bill by up to 15%, helping to addressb fuel poverty and reducing a household’s carbon footprint. The unit is extremely energy efficient, generating an average of 2.5kWh of energy for every 1kWh required to power the unit. By empowering the home owner to avoid discarding items, continuing instead to keep them as a resource, the amount of waste created is reduced. If deployed on a big scale, this would reduce waste collections by the local authorities, which would further reduce carbon emissions. 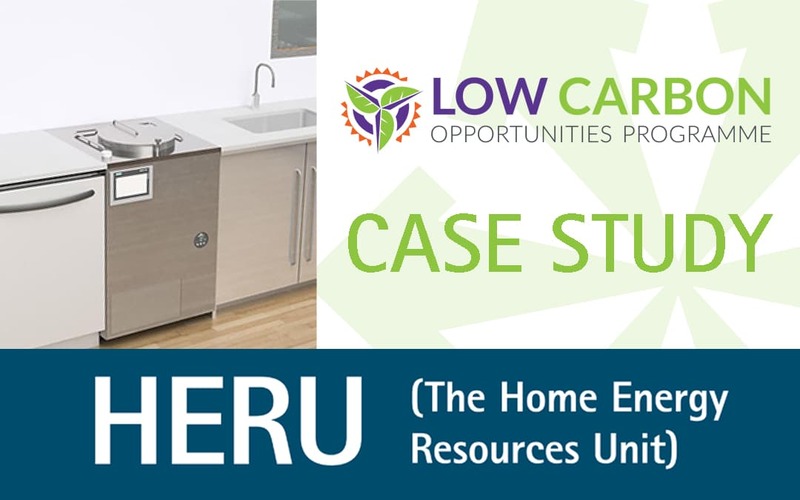 The Low Carbon Opportunities Programme is designed to support low carbon technology development such as the HERU, so it was fantastic when this development, taking place in Worcestershire, was discovered. The programme has supported the development of the HERU with free consultancy support, provided by Isle Utilities, and a grant of approx £42,000. The grant is helping to fund the manufacture and build of the units to be used in the trial phase, with the costs of the trial itself also funded. Through the programme, which is partially funded by the European Regional Development Fund and by Worcestershire Councils, businesses developing low carbon technologies can receive grants of up to 45% of project costs.